Supplementary material reads: "Caption. Glickman. 1954-04-08. Kid pushed in hole, firemen get him out. Van Nuys. 1 shot of firemen bringing [sic] Mark Tracy, age 5, out of 10 foot deep basement surrounding the Central Christian Church in Van Nuys. 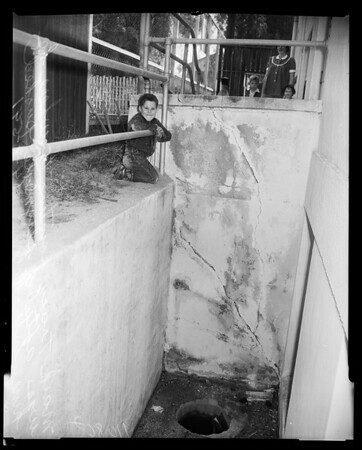 1 shot of Mark Tracy pointing to where he was, after a playmate pushed him into hole".